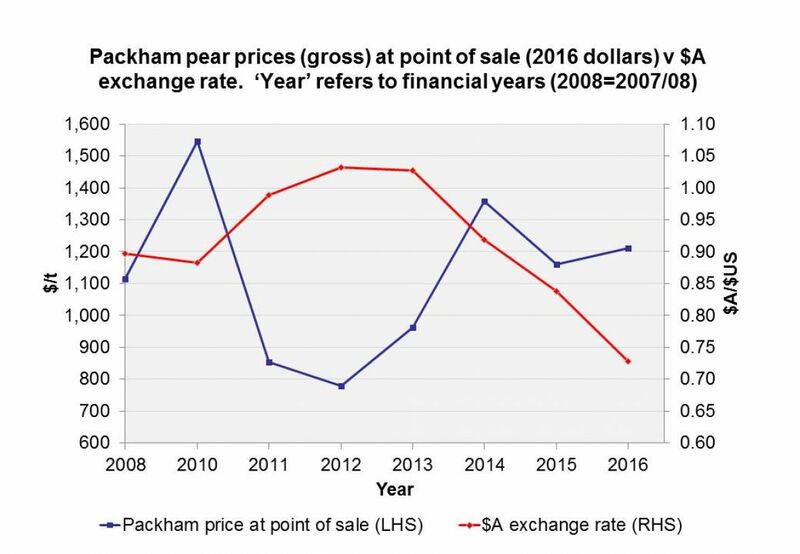 Will investment in new red-blushed pear cultivars grown in 'modern' orchard management systems, yield higher and more stable returns compared to continued investment in European style pear varieties, such as Packham’s Triumph, grown in traditional low density systems? This is the question being researched by Agriculture Victoria, to complement the field research currently underway at the Pear Field Laboratory at Tatura. Three new blushed pears (the Coregeo cultivars ANP-0131, ANP-0118 and ANP-0534), with exceptional eating qualities, are being researched using ‘modern’ orchard management systems that are characterised by high-density plantings of compact trees that use water efficiently, fruit early in life, and produce consistent high yields of quality pears. In collaboration with Goulburn Valley pear growers, Agriculture Victoria researchers conducted economic assessments of the new red-blushed pear ANP-0131 (marketed as Ricō®, previously known as Deliza®) to help growers determine how to grow it most profitably. 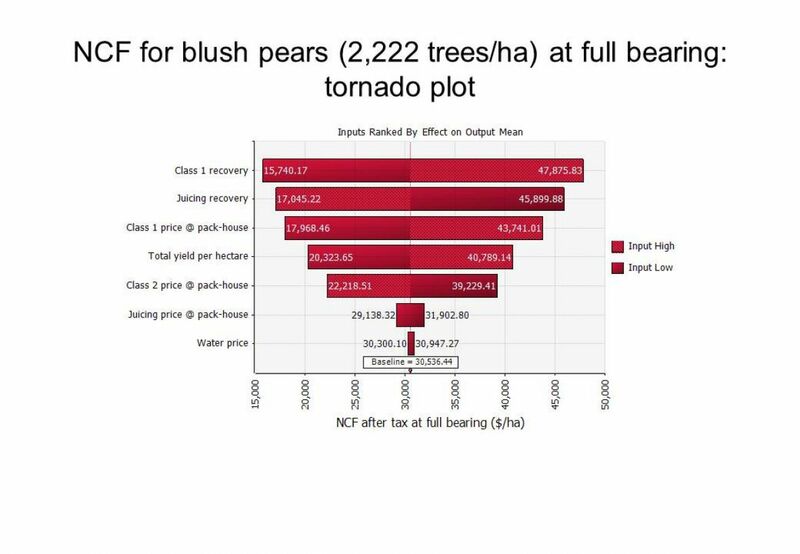 A discounted net cash flow (NCF) model incorporating Monte Carlo simulation was developed to quantify the net benefits and risks of growing the new red-blushed pear cultivar ‘ANP-0131’ on a representative orchard block in Victoria’s Goulburn Valley. 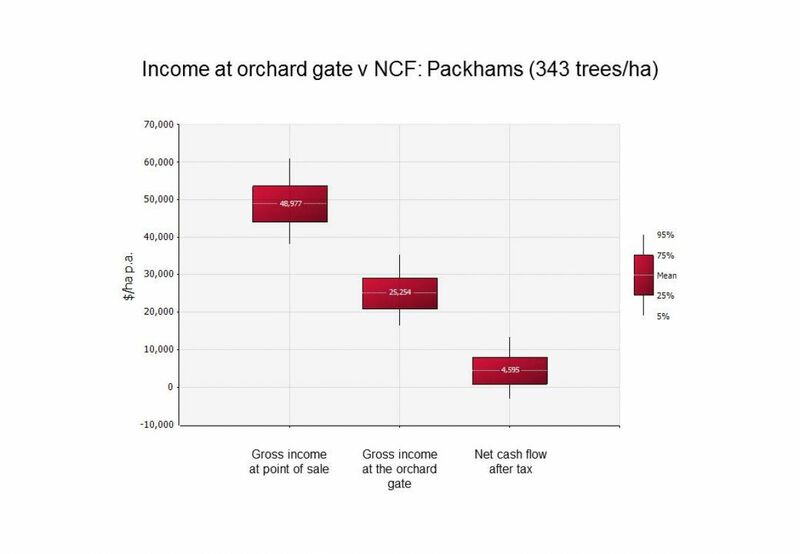 Results were compared to those for retaining a traditional low-density (343 trees/ha) planting of ‘Packham’s Triumph’. 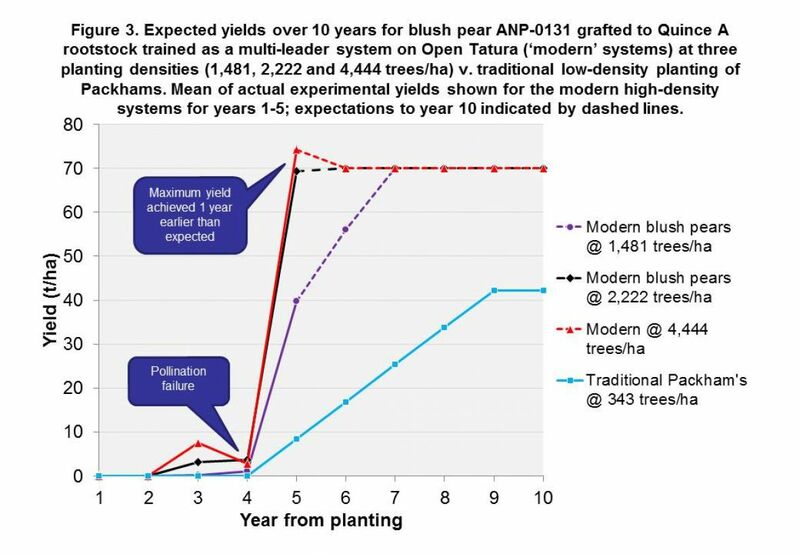 ‘ANP-0131’ was grafted to QA rootstock and trained on Open Tatura trellis at densities of 1481, 2222 or 4444 trees/ha. From 10,000 simulations it was found that growers could invest in the new ‘ANP-0131’ pear system with confidence. 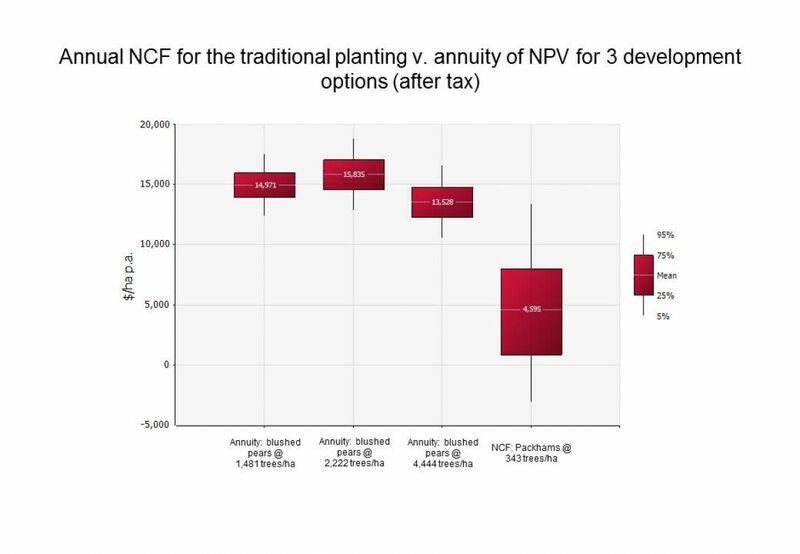 Subject to the law of diminishing returns, the most profitable planting was 2,222 trees/ha, for which the mean Net Present Value (NPV) was $258,471/ha evaluated over 30 years using a discount rate of 4.5% real. The Modified Internal Rate of Return (MIRR) was 10.9 per cent, beating the real nine per cent return on Australian equities. The payback period ranged from 7 to 11 years from best to worst case scenarios. The relative advantage of the new planting over the existing planting of ‘Packham’s Triumph’ was clear; the mean annuity of the NPV for the new planting was $15,835/ha p.a., the NCF for the existing planting was a modest $4,595/ha p.a. and there was a 20 per cent chance that it would lose money in any one year. During 2016 and 2017, the initial findings of the analysis were published in industry magazines and the rural press, presentations were made to industry. The initial findings incorporated actual yields achieved in the experimental orchard for the first commercial crop (year 3 of a 30-year time horizon). See article: http://apal.org.au/expected-returns-from-deliza/ by Kerry Stott, Mark O’Connell, Ian Goodwin and Susanna Turpin. High density, early yielding orchards: Performance report for Blush Pears, a presentation by Kerry Stott, Agriculture Victoria at the Regional Innovation Forum - ‘Delivering innovation through the horticulture supply chain’ Horticulture Centre of Excellence, Tatura May 2016. The economic analysis was undertaken using a participatory case study method comprising several key elements. First, a case study orchard typical of a well-managed orchard in Victoria’s Goulburn Valley. Second, close involvement of AVR’s Pear Field Laboratory Advisory Committee to test assumptions and identify alternative futures for the representative block. 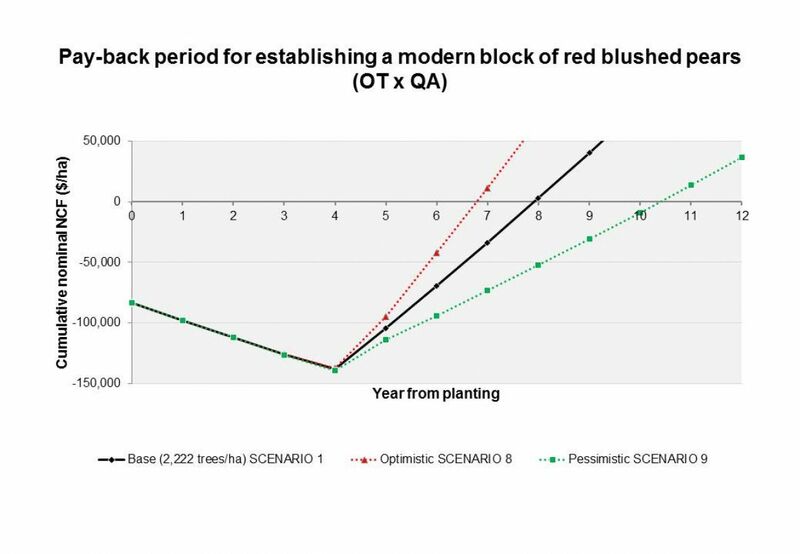 Third, the development of a discounted net cash flow (DCF) model incorporating the Monte Carlo simulation technology of @Risk to evaluate the economic and financial performance, and risks, of adopting alternative systems for growing the new blush pear cultivars. 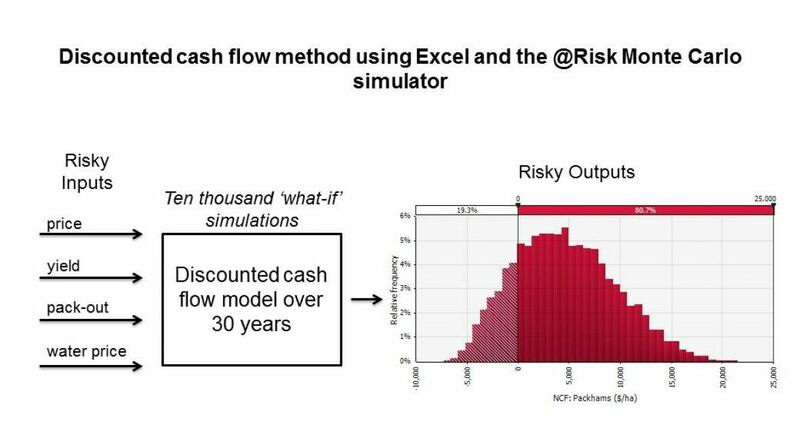 @Risk is an add-in to Microsoft Excel that allows uncertain variables such as price, pack-out and yield to be described by probability distributions. The initial findings incorporated actual yields achieved in the experimental orchard for the first commercial crop (year 3 of a 30-year time horizon). During 2018, the analysis was updated to include actual yields for the two subsequent years (years 4 and 5). These experimental data show the effect on yields of pollination failure in the early years before trees reach full maturity. They also support initial expectations regarding the time taken for the trees to reach full maturity and yield at full bearing. Indeed, the higher density management systems appear to have reached full production one year earlier than expected. Please Note: This information may be of interest to you but the State of Victoria and its employees do not guarantee that the stated assumptions and the information provided are without flaw of any kind or are wholly appropriate for your particular purposes and therefore disclaims all liability for any error, loss or other consequence which may arise from you relying on any information presented.